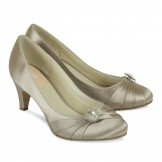 Vintage Wedding shoes remain a popular choice and although the theme is Vintage, what does this actually mean? The current thought is anything from 100 years ago to around 20 years ago is classed as Vintage. In this category you will find vintage wedding shoes that will compliment the 20s look or Gatsby styling as it’s come to be known. This time is also known as the Roaring 20s which is a point in history where fashion was king and shoes were definitely in vogue. Also in this category you will find styles to enhance the trends set and made famous by icons such as Rita Hayworth, for a 40s look, and Marilyn Monroe for the 50s. So whether it's block heels or timeless stilettos you will find the very essence of the era captured here. Victorian inspired vintage wedding shoes are also sought after, with their lace and beading and intricate designs. Diane Hassall, leading designer at Rainbow Club, is the master of vintage wedding shoes and it’s in the Hassall range you will experience an array of hand stitched and hand detailed works of art where each pair is a unique wonder to behold. So, if you have been inspired by a vintage era, you have come to the right place and we are here to help with any enquiry. We have many years’ experience in fitting and mail order and can offer advice, so please don’t hesitate to contact us.